Fantasy owners should already know what to expect from the Rockies. The offense is a powerhouse when healthy. The club could easily score the most runs in a given year. Altitude is linked to increased injury risk, so the health travails of Troy Tulowitzki and Carlos Gonzalez are liable to continue. The 75 win projection relies on a combined 1,080 plate appearance from Tulo and Cargo, so there is some downside to consider. What Coors Field giveth, Coors Field taketh away. Their pitching staff is incredibly fringy, with only a couple players worthy of rostering. Even those are late round picks. When you're the Rockies, it's simply impossible to import free agent pitching. Not only will they refuse to come out of principle, they're actually worth less money to the club. What an exciting rotation. Lyles and de la Rosa are both sinker ball pitchers who can be used as stream starters when they play at sea level. Expect about 6.50 K/9, 3.00 BB/9, and a 3.90 ERA from them. Matzek is the closest thing the Rockies have to a breakout candidate. The southpaw appears to have the inside track on a regular gig in the rotation. He features a 93 mph fastball and a good slider. He uses the breaking ball over 30 percent of the time, which correlates to increased risk of elbow injury. Like Lyles and de la Rosa, I recommend streaming Matzek. He does have a third pitch – a changeup – but it was lousy. Very few starters succeed with a two-pitch arsenal. The Rockies own a couple moderately interesting prospects in Jon Gray and Eddie Butler. Gray possesses a mid-90's fastball that flashed triple digit velocity as an amateur. He's been gunned as high as 98 mph in professional games. He also has a good slider and a developing changeup. He's in line for a midseason promotion. Expect hiccups as the team's number one prospect adjusts to Coors. Butler is the second best prospect in the system. Scouts are worried about his durability, which could limit his ceiling as a starter. If he shifts to the bullpen, he's probably a closer. He throws a mid-90's fastball and a “knockout" changeup. In a brief audition, his fastball and sinker were terrible. The change and slider both showed promise. Hawkins has enjoyed a strange longevity, but he's hanging up the spikes after 2015. The 42-year-old is a veteran of 20 seasons. He probably has the worst strikeout rate among all potential closers. Last year, he managed a 3.31 ERA with 5.30 K/9 and 2.15 BB/9. Expect more of the same this year. There's a place for anyone who saves 20 games without destroying your ratios, but it should come very cheap. Ottavino pitched well in 2014 to the tune of 9.69 K/9, 2.22 BB/9, and a 3.60 ERA. His velocity increased three mph over past seasons. He still had trouble with left-handed hitters, which limits him to emergency action as a closer. The other in-house option, Rex Brothers, is a lefty with sloppy control. The Rockies brought in Axford to serve as a cheap fallback in case the bullpen collapsed. His last successful season came in 2011. Even as his results have crumbled, he continued to maintain high strikeout and ground ball rates. The raw ingredients are there for a resurgence. Elevated home run rates do not bode well for his future as a Rockie. I'll forgive you if you skimmed the pitching analysis sections. Nobody targets the Rockies for their pitchers – it's the lineup that captures our collective imagination. As with any team, there are questions to be answered. Will Tulo and Cargo stay on the field? What should we make of Charlie Blackmon, Corey Dickerson, and Nolan Arenado? As for the injury prone stars, I wish I had inside information to share. We know altitude is linked to increased injury risk. I was hoping both players would be traded over the offseason, but it didn't come to pass. If the club is smart, they'll give the pair frequent rest days. Gonzalez scuffled when on the field last season. His whiff rate increased and his quality of contact declined precipitously. With such a small sample and the possible interaction of injuries, it's hard to project his 2015 performance. The NFBC crowd is cautiously optimistic. He's being selected as the 19 outfielder (47th overall), sandwiched between Dickerson and Yoenis Cespedes. After emerging on the back of a huge April, Blackmon managed to produce at a slightly below average rate. Blackmon's been selected ahead of reliable hitters like Christian Yelich and Jason Heyward, but I worry about his profile. He doesn't hit well against fellow left-handers, and his best numbers come at Coors. I aim to use him as a platoon outfielder. The Rockies may do the same by mixing in Drew Stubbs against southpaws. As such, I'm looking to draft Blackmon outside of the top 100 despite the potential for 15 home runs and 20 steals. There are too many ways for him to lose playing time or get bumped down in the lineup. 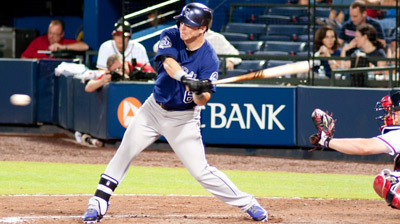 Drafters are buying Dickerson hook, line, and sinker. I'm cautiously optimistic, but I view his current top 50 ADP as a ceiling. It's easy to look at his .312 average, 24 home runs, and eight steals in 478 plate appearances and see top 10 upside. Like Blackmon, he struggles against fellow southpaws. Unlike Blackmon, he should be given the chance to develop against them. It's a double edged sword. He should play every day, but he'll also see his average decline as a result. Above average, five category production still supports a fairly early draft pick. Just beware the various platoon implications associated with him. After a disappointing debut in which he hit .267/.301/.405, Arenado played up to expectations last year. In an injury shortened season, he popped 18 home runs with a .287/.328/.500 line. He's an aggressive hitter who makes a lot of contact. He keeps the strikeouts and walks to a minimum, but he's not so aggressive that he gets the Pablo Sandoval treatment. He's being taken early in NFBC drafts as the fifth third baseman (53rd overall). That's ahead of Evan Longoria, Kyle Seager, Josh Harrison, and Ryan Zimmerman. I'm not as bullish as the NFBC crowd, but I do love his outlook for this season. The Rockies place 25th in our power rankings due to an utter dearth of pitching. The offense possesses multiple top 100 talents, but some of them come with platoon or injury concerns. This should be an informative season with regard to Blackmon, Dickerson, and Arenado. All three players broke out in 2014, but there are still questions and weaknesses in their profiles. Sleepers are few and far between. Keep an eye on the catcher situation, as there could be a free option (Nick Hundley or Michael McKenry) who works his way into full time reps. If Justin Morneau lands on the disabled list, Wilin Rosario could re-emerge as a fantasy slugger with catcher eligibility.